The Xbox One might have stumbled a bit out of the gate, but the Xbox One S and Xbox One X have made up for lost ground by offering features not found in competitors’s consoles, as well as some of the consistently best deals on new systems. It’s also a great time to buy an Xbox One S or Xbox One X, because there’s a big sale on Xbox One games direct from Microsoft right now. Apart from playing Xbox One, Xbox 360, and even some original Xbox games, both consoles also play 4K Blu-rays. If you’re looking for the best deals on an Xbox One X or Xbox One S, there are plenty of great chances to save on a new console or bundle. One of the cheapest deals on a new Xbox One X is with the 1TB Fallout 76 bundle. It’s basically a free pack-in game at this point, and this new bundle from Walmart is an even better deal. Choose from either The Division 2, Kingdom Hearts 3, or Anthem and get a headset, plus the 1TB Xbox One X with Fallout 76, all for $398.89. If you don’t want an extra game and a free headset, you can just grab the Fallout 76 Xbox One X 1TB bundle on sale and save a few bucks. 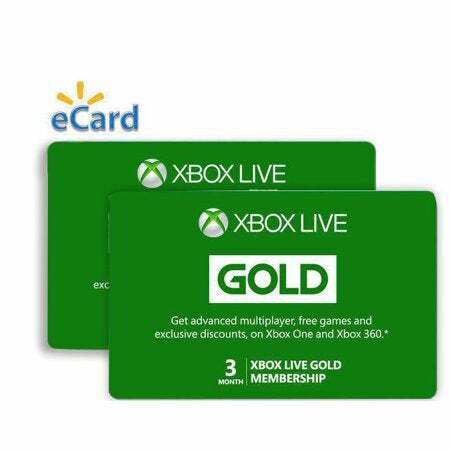 Newegg Flash has a deal on 6 months of Xbox Live Gold. Buy 3 months, already on sale for $20.99, and you get a bonus 3-month code for free. Walmart has a similar deal, minus the savings. While not on sale, Xbox gift cards are a quick and easy way to start loading up your new console with games.